A very happy and prosperous New year to all my lovely customers! Its 2018 and its January and everyone has stopped drinking wine! Why oh why! Drink less and drink better. Mr whirly can help you there, 95% of the wines I have here are from the smaller producer, its all about quality not quantity in your local wine shop in SW17. This at least gives me a little time, amongst my office full of end of year accounts, to write to you about some new wines that we imported just before Christmas and plan some fabulous wine tasting events commencing with Australia day this Friday 26th January (details on the events page) then kicking off February, on the 1st, with some really delightful new imports from Ribeiro, Ribera del Duero and Castilla de Manche, followed two weeks later when we will look at some other new wines from Bordeaux, some revolutionary ” Organic” and Bio wines from Bordeaux, which is a rare thing to find since the Bordelais don’t like change and are pretty set in their ways. 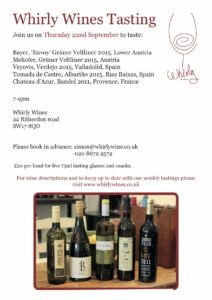 So if you are looking to plan your own private wine tasting this year then get in touch with Mr Whirly and we can arrange it for you. Prices start from £25 per person and we need 8 people minimum to make it work, but we try to give you as much as possible for that, 5 X 75ml measures and snacks too! Try to avoid Thursdays since this is when we have our regular ” Open” wine tasting. From Verona, some simple yet delightfully made wines that drink very well from Villa Aganoor. Their Pinot Grigio, Sauvignon Blanc and Merlot are all well made and have their own character and individuality and show that at this price point wines can be enjoyed. ( £8.95). From Chateau Molhiere in Cote de Duras, their lovely soft Cabernet Franc/Merlot 2015. Top wine, no oak, earthy and an old favourite and well priced at £10.50. A little north west of here, near St Emilion, some ground breaking ” Organic” Bordeaux from “Chateau Grand Francais“. I say this since its rare to find this new style of wine here in Bordeaux, since of all appellations in France, this is the most traditional. Further South in Languedoc, and bottled under ” Vin de France” the very exciting Pinot Noir 2015 from “Domaine de Ricardelle” as well as their Un-oaked Chardonnay. ( £15.50 & £14.50) The Pinot Noir in particular has been a great hit so far sellimng very well in the shop. 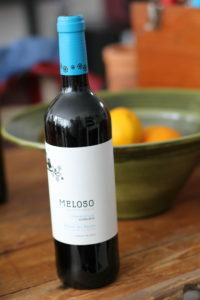 Further south still, from Ribera del Duero, another old favourite, the juicy and delicious Meloso Joyen 2016 Tempranillo, ( £14.50). Further south, below Madrid in the wide ranging ‘Castilla la Mancha` wine area, Dionisos are making some Amphorae aged ” Organic and Bio” Tempranillo, silky smooth and made in the ancient Roman way. Then finally north- west to Ribeiro, “Val de Souto”and the oh so passionate wine maker, Jose Manuel Blanco Perez, who makes wines of such feeling and intensity, being one of the smallest vineyards I work with. His Val de souto 2016 is Godello based with some Loureira and Trixudeira and his “Benedictus Fructus” is quality and beauty all rolled into one, 5 months on the lee’s Godello and Albarino. For tasting notes on all these wines please look at the ” New wines” page, which will updated in the coming day (written 20.01.18). I look forward to welcoming you to the Whirly wine shop soon. Remember, drink less and better and come into Whirly wines for your wines, since i can vouch for every single bottle of wine in the shop, its not a pick and mix here! Its now September and the wines are beginning to flow, in more ways than one. All over the Northern Hemisphere the grapes are beginning to be picked and the year of hard toil in the vineyard culminates into the anxiety and relief of the next few weeks, one hopes. Its an exciting time for the winemaker but also a worrying one. Last minute storms and rain are not in anyway a desire. 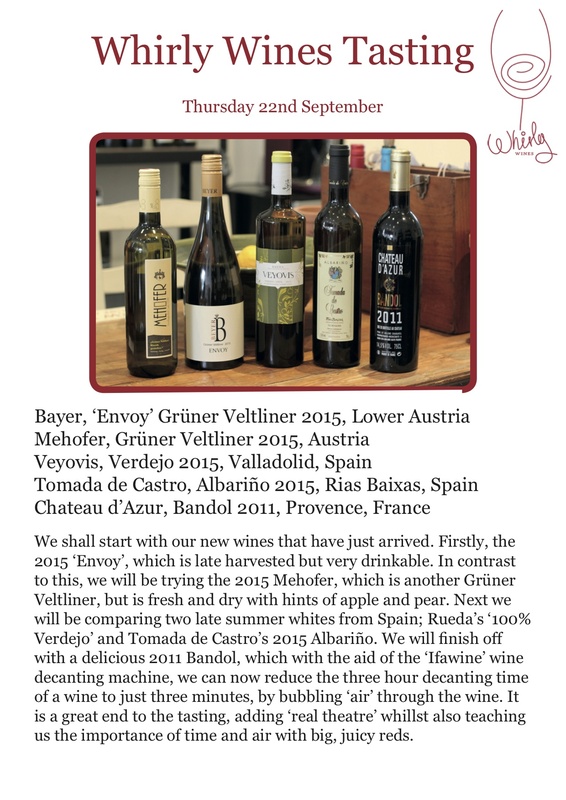 For me as the importer its also a really exciting time since there are so many new wines to look at with the change in season from summer to Autumn. Its the major change on wine lists throughout the country and whereas the focus for the last five months has been on rose and white suddenly the focus now changes to reds with the already the wonders of Grouse on the menus of top restaurants around the UK and soon in October with the shooting season the added joys of duck, pigeon, partridge and pheasant. With such delights I long to match the succulence with a juicy, honest red and this wine performs this job admirably. Its a young Tempranillo, no oak and its full of energy and delight, with plums and Autumn blackberry prevalent yet velvety soft tannins. Ribera de Duero is fast becoming one of the most exciting red wine regions of Spain and with this wine you can see exactly why. It oozes class and value at £12.45 per bottle, available here in the Whirly shop on Ritherdon road, SW17 8QD so do pop in soon and give it a whirl! October: new wines! So many to choose from but has to be the Post referendum wines out of the barrel from Corbiere! So two wines but heh they are both a real joy! “Mr Whirly” is presently in Gascogne on a “Whirlwind” wine tour of South West France looking for exciting wines from the smaller producer that really do “punch above their weight” at a sensible price. With the outcome of “Brexit” ( sorry to bring politics into this post!) and the fall in value of the £ this is clearly a priority over the next month and possibly years, who knows? I am in the middle of writing up my notes on this trip and this shall be posted on this website by end of play today, Wednesday 29th June. Anyway onto happier things, tasting wines this week!! Below are the wines we shall be tasting, please double click on the link below and it will come alive!. Please do let me know if you can make it wont’t you since last week was the best attended so far with 12 people attending so we might need to stagger the bookings this week. 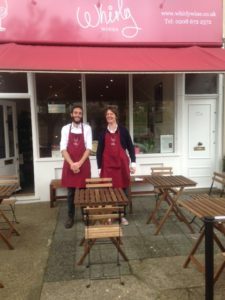 Whirly Wine’s goes ‘On Trade’ as well as ‘Off Trade’, Easter wine’s and opening hours…. I am delighted to announce that Whirly Wine’s will be opening an ‘Aperitif’ bar at the Whirly Wine shop in April 2016. We have successfully applied for a variation of the license and as soon as Spring has officially arrived, we will launch the new project. We aim to make Whirly Wine’s far more accessible to our local customers, by allowing you to taste the wines before actually buying them ( 75ml and 125ml glasses will be served).We will be looking to change the wine list every week, offering wines that suit the climate as well as newly arrived wines from the various countries Whirly Wine’s carefully sources from. In time we will also be offering a fine array of cold foods that have been carefully selected to compliment the wine. We are in the process of creating the outside seating area at the front of the shop. Ideally we would like to have some old French bistro collapsable style tables and chairs but they are difficult to source. If anyone has anything fitting the description that they no longer want, do let us know! We will keep you informed about the opening day but please feel free to pop in and discuss your thoughts with Mr Whirly and his rascal dog Dash! I have some lovely Easter wines here in the shop too so please come down and have a chat about what wines you would like to go with your Easter lunch! 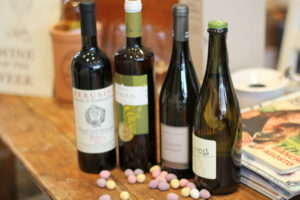 My top suggestions would be some Veyovis Verdejo from Rueda at £10.95; lovely Spring wine, full of verve and freshness! Also lovely for Easter would be the Domaine Prevote Sauvignon Tourraine 2014 at £10.75; stunning SB at a lovely price, really zingy and full of energy but not in anyway flowery! For reds try some Perusini Refosco 2014 at £16.75 from one of the most exciting wine regions in Italy, Collio in Fruili. This wine has great acidity and is fruit led but in a very restrained way and would be be a perfect accompaniment to a shoulder of lamb for your Easter Sunday lunch. Lastly if you think some fizzy would kick off your day well I have good stock of the Lemoss Prosecco NV from Ca di Rajo in Treviso at £8.99. This wine is going through a second fermentation in the bottle, is slightly cloudy and unfiltered and tastes like a well made cider from Calvados, full of fresh apples and yeast. Its well worth a whirl! So please do pop in for a chat in the coming days and let me know what you plan to eat and I shall try to match some Whirly wines for your special lunch or dinner. The shop is open Good Friday from 11.30 am to 5pm and Saturday 26th March from 11am to 5pm. The shop will be closed Easter Sunday and Easter Monday. Thank you for your continued support and a very Happy Easter to you all! The first Whirly Wine tasting on 25th February went down a storm with my wholesale clients! These included ‘Hakkasan Restaurants‘, ‘The Palmerston‘ in Dulwich, Balham’s ‘Lambert’s‘ and ‘The Exhibit‘, ‘The Hood‘ Restaurant on Streatham High Road and ‘The Begging Bowl‘ in Peckham. The outstanding wines of the day were the Willespie Margaret River Red 2010 and White 2011 and Jean Michel Sorbe’s Quincy 2014. But to be honest, all 20 wines shown on the day were showing extremely well. 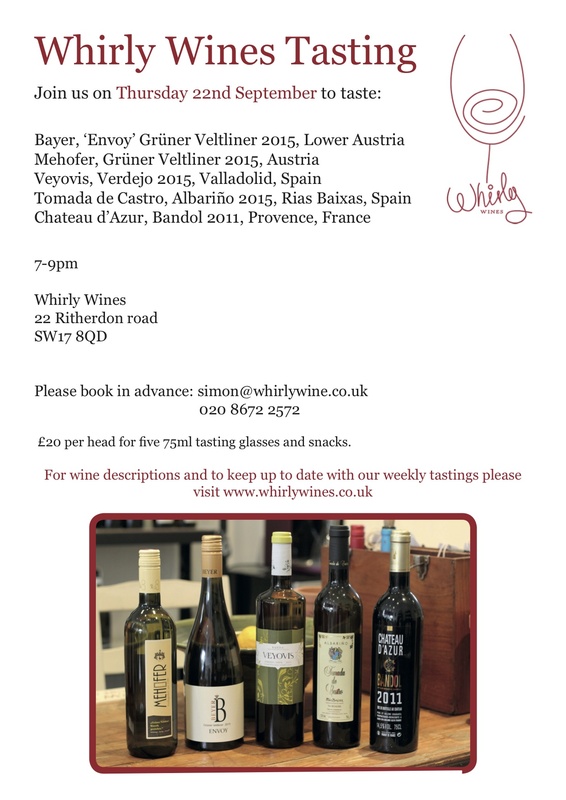 Don’t worry if you missed out, Whirly Wine’s is constantly sourcing exciting, individual wines from small producers from all over the world consequently we will be hosting another trade tasting at the end of the summer. From Porto we drove north to the Spanish border and onto the centre of Riax Baixas country, Cambados in the region of Val do Salnes. This is the region where all wines are made from 100% Albarino, one of the most exciting new grapes to come into the wine world. As we discovered the wines are best young although some of the wine can be aged a few years with a little oak. At “ A Dispensa de Ribera” we tasted some lovely Albarino from “ La liebre lyla Tortuga” ( with a hare and a tortoise on the label!) so I am presuming this is what Liebre and Tortuga mean as well as Alberto Nanclares, much less vibrant and a 2011 vintage, possibly oaken and with an “ organic” certification so with minimum sulphites. It did grow on me I must admit. The next day we visited the family owned vineyard, ‘ Tanuda de Castro” and we met Elizabeth the owners daughter. We had been recommended to visit the vineyard by Jose at the Vinoteca in Cambados, so off we sped in our little Fiat Punto, a few miles across country to the little village of Ribadumia. Once again we witnessed the very old style of vines being grown in a “ Pergola” formation, high up and along a canopy with one vine in each of the four corners. I had previously witnessed this way of vine system in Vinho verde in Portugal. We tasted the new 2013 Albarino out of tank which was vibrant and clean. It compared well to some very good wines from the night before. The 2012 from the bottle, was their present vintage and it was drinking really well with some lovely vibrant fresh fruit and once again was wonderfully clean and fresh. Clearly the wine business in Spain is having a tough time with many problems in payment from what was once their core market; restaurants and bars in their local towns and cities. So they are now looking to gain an export market more and I think this wine would go down very well this summer in the UK, so I am hoping to export this wine soon. Albarino is a great wine to go with fish and shellfish. Its pretty serious too in terms of its makeup and mouth feel. Its one of those grapes that oozes class. the romantic stories of it arriving here with pilgrims from Germany on their way to Santiago de Compestel might not be true and but there is no doubt the grape has similar qualities to Riesling and Pinot Gris. I also visited the Organic vineyard of Nanclares but he was away in Barcelona at an Organic wine meeting. After Jamon and Cafe con Lecce with Murcia at cafe Murcia next to the fish market in Cambados we headed across the mountains to Ourense and Ribeiro to meet Brais and Jose Manual Blanco Perez at Val de Souto ( see picture above) in the DO Ribeiro. It was great to meet these two people at last and it emphasised to me the importance of the small vineyard and control of the vineyard space. the vines here are located high up on the steep hills that rise up from the River Mino to the east of the river. In the village of Souto there are 14 families that live and have lived here for many years. They own all the land up here and the vineyards are therefore confusingly arrange with one small plot belonging to Jose Manuel then another next door belongs to someone else. They are very small little plots of land too and Jose vineyard is called a Colleiteiro, which means that they do not buy in any grapes at all. A Bodega can buy in grapes if they wish. The best way of seeing where Jose’s small plots finish is that one piece of vineyard is covered with grass and Jose’s has been recently ploughed. Down on the flat level are grapes like the Triexudura and the red grapes, Mencia and Brancellao and up on the hills, the vines are much closer together so some have to be picked by hand; here are Godello grapes. The younger vines have been planted further apart form each other that give great grape quality and flavour as well as being passable in between by a small John Deere tractor. With the help of Brais translating and a large plate of Octopus with Paprika we discussed the present market in Spain and the fact that Jose Manuel had to look to export his wines too, in order to survive. He makes clean, fresh wines from 3 grapes: Godello, Treixudura and Lourieria. The ethos behind my business is highlighted through this small family wines business. hard work and total control of the vineyard; Jose manuel will work the land 365 days of the year, he cannot leave this little valley of Souto and nor does he want to. His life is here and he is very happy to have the fortune to do this I feel, inheriting the land from his father, grandfather. great grandfather. He cannot afford to be Organic and certified here. He does not have the money for that. But he sprays very rarely and only when he needs to, if after a great deal of rain then he will spray a little Sulphur. Some wineries with out control he explains will spray Sulphur every week. This they feel will give them more grapes! Yet sulphur will harm the grapes and the wine: its why commercial wines made without control will give you a headache since they are full of Sulphur and it perfectly highlights the need for control of this. Val de Souto offer me wines that are vibrant and full of energy and they are a pure delight. They are not organic but they don’t need to be: they are very good and made with the care and attention that wines from small hands on vineyards with the owner winemaker at the helm will always produce. With a smile on his lovely face Jose Manuel realised that we understood him and his philosophy so well.